A mother-daughter team serves up cookies, cakes, éclairs, and more in a cozy storefront in Gaston County. At See Jane Bake, you won’t, actually, see Jani Divers bake. She manages the bakery’s finances and marketing, but it’s her daughter, Emily, whom you’ll find in the kitchen. “She’s wanted to be a pastry chef since middle school,” Jani says. 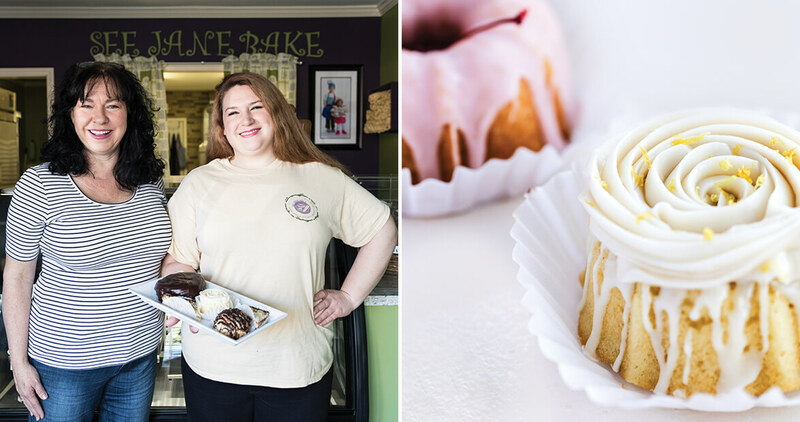 After graduating from Le Cordon Bleu in Atlanta, Emily started See Jane Bake at just 23 years old and now occupies a petite brick-and-mortar shop in McAdenville. Though the bakery is barely 500 square feet, it’s known for its larger-than-life treats, from giant sugar cookies (“They’re the size of a baby’s head!” Jani laughs) to orb-shaped éclairs, a favorite among customers — and Jani. Emily created the “I Do D’éclair,” with a caramel cream belly and chocolate ganache coat, just for her mom.